NEW ORLEANS – The same 12 men have been included in some form or fashion on the Men’s Watch List for The Bowerman Award in each of the past two updates. The only thing that changed from the Mid-Outdoor Watch List that came out on April 20 and the Pre-Conference Championship update that was released today by the U.S. Track & Field and Cross Country Coaches Association (USTFCCCA) is the order in which those 12 men are listed. Ultimately it comes down to two men: Grant Holloway and Emmanuel Korir. Last time out Holloway owned one of the 10 spots on the Watch List and Korir took up residence in the “Also Receiving Votes” section. This time they’ve switched spots. Also Receiving Votes: Grant Holloway (Florida), Devon Williams (Georgia). Korir rejoined the Watch List for the first time since March 16 and is billed alongside KeAndre Bates, Edward Cheserek, Christian Coleman, Mostafa Hassan, Josh Kerr, Ioannis Kyriazis, Fred Kerley, Chris Nilsen and Lindon Victor. There is good reason as to why Korir gives UTEP its 17th Watch List mention in program history – which is the 7th most by a men’s program in Watch List history. Korir turned heads two days after the last Watch List came out when he clocked a time of 44.78 over 400 meters on April 22 at the UTEP Invitational. Less than one week later, Korir challenged Donavan Brazier’s year-old collegiate record at 800 meters. Korir negative split the race at the Brutus Hamilton Challenge in Berkeley, California, and crossed the finish line in 1:43.73 (Brazier’s mark stands at 1:43.55). Bates reestablished himself as the favorite to win the NCAA triple jump title in Eugene, Oregon, when he recorded an NCAA-leading mark of 16.70m (54-9½) at the Tom Jones Memorial this past weekend. The Florida junior is still ranked 2nd nationally in the long jump. Cheserek hasn’t raced since the Stanford Invitational, but that’s going to change this weekend. The Oregon standout now has 27 career Watch List appearances and is scheduled to take part in the stacked 5000 at the Payton Jordan Invitational. All signs point toward Cheserek taking aim at Henry Rono’s 38-year-old collegiate outdoor record in the event (13:08.4h). Coleman moved back on top of the NCAA Division I Descending Order List at 100 meters. He notched a windy 9.93 at the SEC Relays this past weekend. This was the 3rd time in Coleman’s career that he went sub-10, regardless of wind, with both times coming last July at the U.S. Olympic Trials at Hayward Field. Kerley turned in an NCAA-leading time of 44.60 at the Michael Johnson Classic on April 22 and helped Texas A&M set a collegiate record in the sprint medley this past weekend (3:11.94). That broke a 17-year-old standard of 3:12.13 that Arkansas set back at the turn of the millennium. Nilsen took over the NCAA lead in the pole vault at the Sioux City Relays. The freshman vaulted 5.73m (18-9½) there and placed 2nd in the elite section of the prestigious Drake Relays this past weekend. Hassan (shot put), Kerr (1500), Kyriazis (javelin throw) and Victor (decathlon) haven’t improved their marks in their respective signature events since the last Watch List. Holloway joined Devon Williams in the "Also Receiving Votes" section. 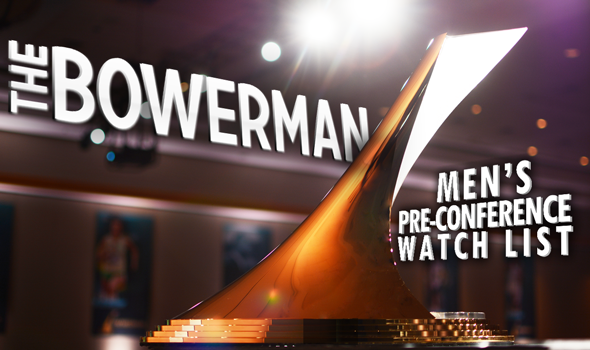 The next Men’s Watch List will be released on May 18.